iConnect is an online portal for international students, faculty and visiting scholars, and the UO departments and academic advisors working with international students and scholars. iConnect will be used to submit requests, updates and applications for a variety of immigration purposes. There are many important steps to follow before you arrive on campus. To assure your arrival is as smooth as possible, follow the steps in the UO pre-arrival check list and register for orientation. 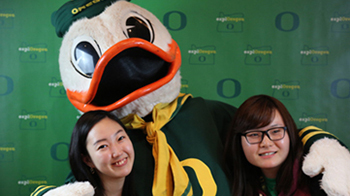 While studying at the UO, it is important that you know the rules and regulations to maintain your visa and immigration status. There are also many resources for students with financial need. Our office provides immigration support for university departments wishing to hire or sponsor international faculty, staff, researchers, or visitors on courtesy appointments. Have questions about new immigration policies? UO is carefully tracking changes in immigration rules since the Executive Orders on January 27, March 6, 2017, and September 24, 2017. We realize that many people in our community are quite concerned and need a one-stop location for answers to the most common questions about this changing situation. For questions about changing federal immigration rules and UO support for our international community, please review the FAQs.